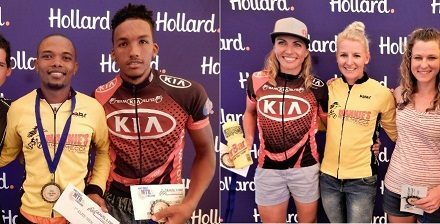 Namibian ace cyclist, Dan Craven, did not have much trouble winning the main category in Sunday’s Nedbank Cycle Challenge in and around Windhoek. Not to be outdone, Vera Adrian won the women’s 100 km event, finishing a mere 27 minutes after Craven. Nolan Hoffmann took second spot in the men’s 100 km with Alex Miller third. Among the women, stallwart rider Michelle Vorster came second and Genevieve Weber third. Windhoek’s Central Business District was abuzz on Sunday with more than 1000 cyclists competing in eight categories from the leading 100 km event down to a 20 km circle for less competitive riders. The 60 km Men’s was won by Devon Farmer with Bergran Jansen second and Konrad Marais third. In the same distance for women, Mimi Hough pulled in first followed by Marion Schönecke and Rina Lambert. In the Men’s 30 km, Jurgen van Wyk was victorious with Rian Kritzinger second and Francois Prinsloo third. Lene du Plessis lead the women over 30 km, with Bianca Jansen van Vuuren second and Jean-Marie Mostert third. Finally, among the social riders, Gerhard Cornelissen took the honours in the Men’s 20 km event with Fariet Cornelissen second and Lyndon Platt third. For the ladies, Delsia Jansen van Vuuren carried the banner, pushed along by Carmi Pauw and Kylie Dickerson. Caption. From the left, Alex Miller, Dan Craven, Nolan Hoffmann, Genevieve Weber, Vera Adrian and Michelle Vorster.